Sometimes we fall in love with someone we don't even know or someone we met the first time. In buses or public jeepneys you may also find yourself falling in love with someone next to you without even talking to him/her. What do you think of this feeling? Can this be turn into true love and eventually a deep relationship? Well, Let me tell you about my story. I meet her in the first day when I go to university. We meet at school's dormitory. We talk some stuff about studying. Then I feel that I fall in love at her. Later, I meet her more and we have a love. We have graduated 2 years ago and now we are married. Do you thinks my story is so good? I belive in love at first sight! Yes, that's a wonderful story and a very good example of love at first sight.I Wish you all the best and hope your relationship last longer. well. thanks for that dear. hope you also make a first look like me. It's hard to say really. My father says he just " knew" she was the one and they have been married for almost 30 years coming soon. I would have to say that it isn't a value of love per se but an infatuation of incredible stature. You see an angel in your eyes and you desperately don't know what to say nor feel. That's true also, but because our society defined infatuation as being love, it's hard sometimes to determine whether you are falling in love or just having desire. Whenever it happens with me ( I do admit it ) I normally see how I feel after the 2nd date or so and see if the feeling is the same. First, we have to know the true meaning of love and what it really means to us. I don't really believe in love at first sight. In the first place how can you love someone you don't know. That kind of feeling is not love but attraction because the basis is more on physical. Love is unconditional and must be built in a relationship. You got a good point there, but in our society right now, they defined that feeling as being love and that's what we called "eros" in Greek. Love has different meanings defending on who is the person involved. Maybe for us we do not consider it as love, but for some others who experienced it, it's true love. 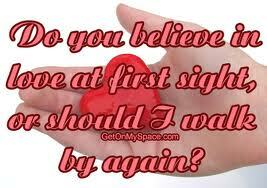 For me yes me in my husband is love at first sight after all I love him and she love me too. I guess this is what we called it admiration. As human, we are capable of admiring. Yet sometimes they also refer this love at first. This is true, eventually, when you are able to chat or talk a little, the admiration me eventually get deeper, and sometimes you see yourself one day longing for his or her presence and you are already in love by that person. Good day and happy mylotting. Yes it may be true for others who felt it and eventually get into deeper relationship, but for some, it's just an admiration or infatuation that easily fade. I agree, I'm also picky when it comes to relationship, the feelings that we feel sometimes is tricky, we can't just tell that we fall in love just because we attracted to someone we met for the first time, it may change eventually as time goes by. You're right, it could only be infatuation when you have an attraction to someone but some other people defined it as love. Yes, most of the time it's lust at first sight. I do believe love at first sight . But its a deep feeling to love a person at first sight . It might also be said as attraction but we will not be attracted to all the person we see at first sight. Yes it can be turned into true love and a very good relationship . But first you have to be friend whom so ever it may be than you have to check that the person is fit for the long term relationship . Every good looking person may not be having good character. Yes, that's true, not every good looking woman may have good character also. I believe in attraction and infatuation and desire at first sight. i don't believe in true love at first sight though. Love takes time to blossom. If it;s love at first sight, how can you know that it is real? That's a good point. I'll give you a plus on that. No not really, we can be attracted to people and see positives in them but love is a strong feeling that develops over time, but enough time where you actually really do know the person rather than instantanious where as when you just meet, that isn't love. Maybe meeting someone, spending time with them and getting to know eachother more and learning more and doing things together as a couple may then later develop into true love, i guess with this only time would really tell. But you have to make an effort to let them know that you are interested in them, then you take it from there and see where it leads to. I don't believe on this. Love is not made in a blink of an eye. First impression may last, but it doesn't mean that when you saw a guy for the first time, and you like him/her at that first seeing, it is love already. Love can be developed from that, but It is now love that you felt when you saw, it is just admiration. Yes,it happens to a lot of people. It happened to someone I know who gave up a bright future in the US after he met the woman he wanted to spend the rest of his life with. Three days after meeting her, they eloped and seven children after, they have increased their clan with 17 grandchildren and 3 great grandchildren. Amazing. Is there anything like that? Could be lust you know!